This is another one of those cupcakes recipes that has been in my head for ages. They were inspired by the little paper umbrellas that I picked up at World Market a couple years ago. They turned out just as delicious as I hoped. 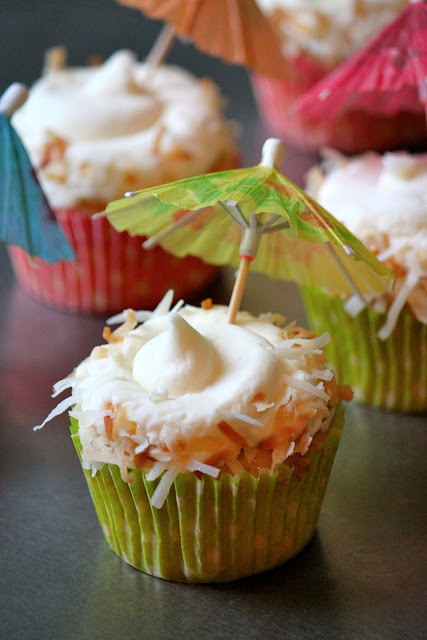 I chose not to include alcohol or any rum extract in these because I did not think they would really enhance the flavor, but if you want a more authentic Pina Colada taste then go ahead and add either some rum or rum extract. 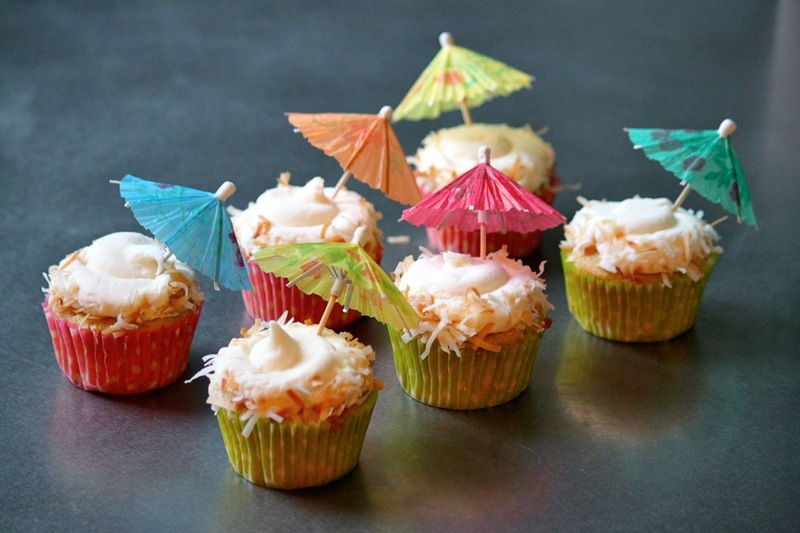 I decorated the edges of the cupcakes with toasted coconut which is completely optional, but a nice touch if you ask me. These are really perfect for a summer BB-Q or a Pool Party. In a medium bowl combine the flour, baking soda, baking powder, and salt. In a separate mixing bowl, cream the butter and sugar. Beat in the eggs, one at a time. Add the vanilla; mix well. Add the flour mixture to creamed mixture alternately with the coconut milk and pineapple (batter will be thick). Fill paper-lined muffin cups with 1/4 cup of batter. Bake for 25-30 minutes or until a toothpick inserted near the center comes out clean. Beat butter and salt until creamy. Add powdered sugar 1 cup at a time alternating with pineapple juice and coconut milk until fully combined.